If you thrive on challenge, then earning the Supernova award will be right up your alley. To be eligible, you must be a First Class Scout or higher. As a prerequisite, you must first earn any three of the four Nova awards for Scouts BSA. With your parent's and unit leader's help, you must select a council-approved mentor who is a registered Scouter. You may NOT choose your parent or your unit leader (unless the mentor is working with more than one youth). 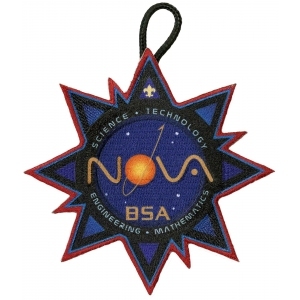 The Scouts BSA Supernova awards recognize superior achievement by a Scout in the fields of science, technology, engineering, and mathematics (STEM). All experiments or projects should be conducted using the highest level of safety protocol and always under the supervision of a qualified, responsible adult. The Scout should always have a buddy when meeting with their counselor or mentor. The following requirements apply to any specific topic chosen by a Scout in the course of completing a Supernova award. No matter what STEM activity you choose, you will need to create a report. Reports are a regular part of the work of professionals in various STEM fields, so these tasks will be good preparation for future career demands. Notice that it doesn't say write a report. You are not restricted to just writing a report, although you may choose to do so if you like. Any report will probably involve some writing on your part, but the report itself may be created and presented in any number of ways. Use your imagination! You may choose from any of the formats below for your report, or you may create a combination of these formats. You may create something entirely new as long as your Supernova mentor approves. The objective is for you to communicate what you have learned to others in a way that helps them understand what you learned and how you learned it. The report must provide sufficient detail so that someone unfamiliar with the topic can understand the content. For each format, you are encouraged to incorporate a variety of ways to present your information and to use technology to create a polished presentation. For example, an oral report might include a PowerPoint presentation as a visual aid, or a poster presentation might include a slide show of your activity. Be creative.